October 2, 2018 -- French researchers have revealed that digital tomosynthesis has a similar diagnostic performance to x-ray for the diagnosis of prosthetic loosening after total hip arthroplasty, but it yields better interobserver agreement, making it a suitable adjunct to x-ray for inconclusive cases. Their study is the first to compare the performance of digital tomosynthesis with that of x-ray and CT with metal artifact reduction for diagnosing prosthetic loosening in total hip arthroplasty patients, according to its authors. The study revealed that while diagnostic performance of digital tomosynthesis was similar to x-ray, CT with metal artifact reduction had higher sensitivity than the other two modalities. "CT with metal artifact reduction is the best imaging exam after a doubtful x-ray, but not every department has access to it. 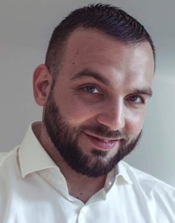 Digital tomosynthesis, on the other hand, is more reproducible in France; three times less expensive than CT with metal artifact reduction; and has better agreement than standard x-ray," said lead author Dr. Romain Gillet, a musculoskeletal (MSK) radiologist at the Guilloz imaging department at the University Hospital of Nancy. "You can also perform digital tomosynthesis on the same machine and at the same time as the x-ray exam without disturbing patient throughput." Anteroposterior x-ray (a), anteroposterior tomosynthesis (b), and coronal CT-metal artifact reduction reformat (c) of a cemented right-sided total hip arthroplasty. Note the doubtful osteolysis in zone III in image a, better depicted in image b but clearly better seen in image c. There is also osteolysis in zone I, only seen in image c. All images courtesy of Dr. Romain Gillet. Speaking to AuntMinnieEurope.com, Gillet said it was time to promote digital tomosynthesis for prosthetic loosening in the hip as a complementary investigation, with CT with metal artifact reduction a third tack to take when x-ray with digital tomosynthesis still remained inconclusive. In the current study, 49 patients (23 women and 26 men) with painful hip prosthesis underwent x-ray, digital tomosynthesis, and CT-metal artifact reduction for prosthetic loosening between January 2012 and January 2016. The group deemed periprosthetic radiolucent lines wider than 2 mm in two or more Gruen or De Lee and Charnley zones as diagnostic of prosthetic loosening, and all prosthetic loosening cases were confirmed surgically. There were 21 cases of prosthetic loosening, nine of the acetabular component only, and 12 of both acetabular and femoral components (European Radiology, 7 September 2018). Two radiologists with four and six years of experience, respectively, independently evaluated the anonymized images displayed in random order and were blinded to clinical and surgical patient data. The radiologists evaluated the images in four readout sessions (conventional x-ray only, digital tomosynthesis only, CT-metal artifact reduction only, and x-ray associated with digital tomosynthesis) with at least a two-week interval between them. They based analysis on the evaluation of each zone of Gruen and De Lee and Charnley for the presence or absence of periprosthetic radiolucency. The group then calculated the sensitivity, specificity, positive predictive value (PPV), and negative predictive value (NPV) for each reader and each imaging technique for prosthetic loosening detection in the acetabular and femoral prosthetic components separately and together. The key findings were that plain x-ray is still the first imaging step when hip prosthesis loosening is suspected, but interobserver agreement is better with digital tomosynthesis than x-ray. Dr. Romain Gillet from Nancy. Furthermore, sensitivity of CT with state-of-the-art metal artifact reduction is superior to that of digital tomosynthesis. The authors noted for both the acetabular and femoral sides, digital tomosynthesis had a specificity for prosthetic loosening detection similar to that of x-ray and CT-metal artifact reduction and a sensitivity similar to x-ray but lower than CT-metal artifact reduction. The results are shown in the table below. Gillet noted the PPVs were good for each imaging technique. When x-ray with digital tomosynthesis exams were positive for prosthetic loosening, this was almost always proved surgically. However, NPVs were lower for x-ray and digital tomosynthesis than for CT-metal artifact reduction, showing that CT-metal artifact reduction remains the most reliable tool for ruling out prosthetic loosening. Compared with x-ray and digital tomosynthesis, the interobserver agreement was higher with CT-metal artifact reduction regardless of the prosthetic component in question. When the radiologists evaluated x-ray and digital tomosynthesis in association, the interobserver agreement improved, but this was still lower than that of CT-metal artifact reduction. 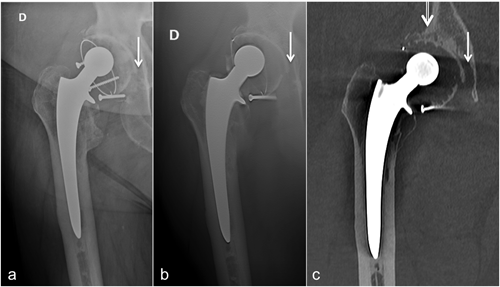 The French group has planned a further study that compares CT-metal artifact reduction with digital tomosynthesis-metal artifact reduction for prosthetic loosening in the knee. Currently, the group is working on a study about MRI bone marrow perfusion in the femoral head. The department also recently wrote an article about digital tomosynthesis in MSK pathology in Diagnostic and Interventional Imaging, a paper on dynamic CT of the wrist published on 25 September in Radiology, with an earlier study about dynamic CT of the wrist published in the April 2018 edition of European Radiology, and a paper on vascular imaging focusing on dynamic angio-CT of thoracic outlet syndrome published in the March/April 2018 edition of the Journal of Thoracic CT.
"The department here in Nancy prioritizes prosthetics imaging as there are many referrals from surgeons. There are more studies needed in MSK digital tomosynthesis, a relatively new area, specifically for knee arthroplasty," Gillet noted. "We believe that because x-ray techniques are mandatory in MSK radiology, digital tomosynthesis may also become a routine tool in this kind of imaging because of its tomographic nature and potential improvement compared with standard x-ray."